Giveaway Winners, Fashion, and Dazzleglass! My lovelies, I just first of all want to announce and congratulate the winners of my Mineral Magic Cosmetics Giveaway. In order, Prize #1 goes to hana, Prize #2 goes to Miss (Daniela), and Prize #3 goes to Young. I will be sending you an e-mail shortly, so please let me know your addresses so I can send off the prizes! I really appreciate all of the entries, and I think these ladies really deserve these gifts! Speaking of shoes, I recently bought another pair of shoes that I am really stoked about. As a size 4, it is actually rather difficult to come across basic black heels that should be pretty standard for work wear. I never see size 4's at Marshall's but I happened to quickly run into one and couldn't pass up these cute buckled heels for only $34! The stacked heel isn't too high and I am -such- a fan of buckled toe details on shoes. I decided to pair it with this thrifted Victoria's Secret slip, long charcoal cardigan from Forever 21, and my favorite grey skinnies from Abercrombie kids. I also apparently wore that same zipper-flower headband from F21 with this outfit (which you may remember from a previous post on lipstick). Obviously, I am ridiculously behind on posting. 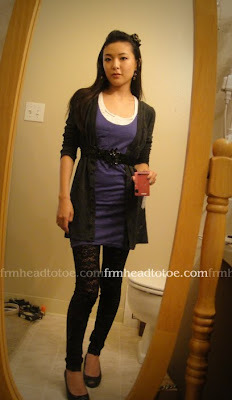 I loved wearing this outfit! Many compliments. 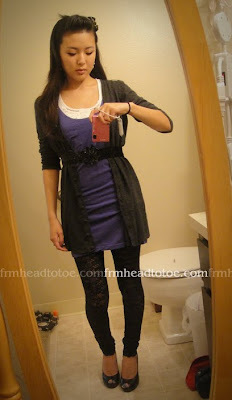 I chalk it up to these totally amazing lace leggings from Forever 21. They are a thicker lace, similar to fishnets, so they feel more sturdy. A close-up of the leggings. Since the leggings are already a bit flashy on their own, I tried to balance out the "sparkle" factor with this amazing sequin belt from Target's girls section. 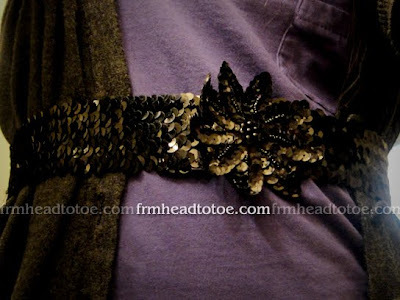 Easy way to find a waist belt! This entry is already getting long-winded, but I also decided on this particular day to whip out my Dazzleglasses to swatch for you all. Can I just take a moment to say that I LOVE these? Yes, they are sticky but the effect is just ridiculous in a good way. GLITTERBOMB! 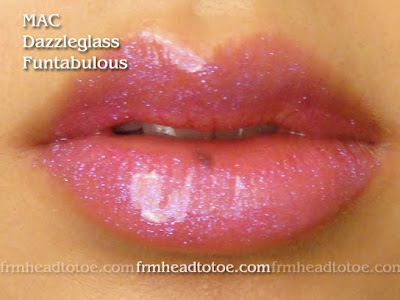 And I have had some glitter last to the end of a workday, even through lunch with no reapplication. I won't write much, just post pics of the awesomeness. Money, Honey. Great for everyday looks. Love Alert. Redder than my pic shows, and very sweet. And saving the best for last, Funtabulous. Friggin purple glitter. 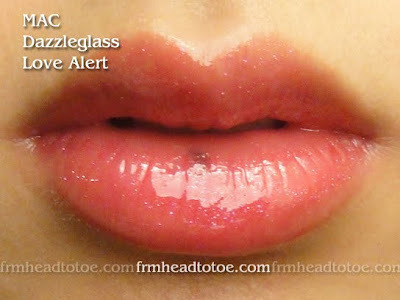 I cannot tell you how hot this looks over fuscia lipstick. Even by itself, it is a show stopper! This is how it looks on me. I just love it so much. It really pops! If you have a favorite Dazzleglass, let me know what you recommend in the comments since I'm sure I'll want more in the future. Anyway, that's all I have for now. Hope you all have a great weekend! omgosh i have the same headband in red, it's so different, i love it. and i cannot believe how tiny your feet are, i thought mine were small. Nice! I was wondering how those lace leggings would look and you've convinced me to go buy them. 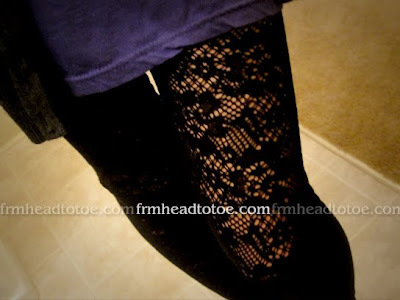 The lace leggings are soo cute! I must have a pair! Cute new shoes and love your outfits! Wow, your feet are incredibly tiny. By the way, I love your jeans! What size are you in Abercrombie kids? Love your skinny jean! Btw where do you get those jeans for shortie like us hehehehe.. I'm having trouble finding the right fit skinnies as I don't want to get the regular length trimmed - it changed the style. You are adorable. Love your outfits! Bratty Boo, I love you!